Falvey Memorial Library :: Where Can I Study in Falvey? Four Floors of Choices. Where Can I Study in Falvey? Four Floors of Choices. Falvey offers a variety of study spaces, some available only when the Library is open and others, the twenty-four hour study lounge (with Holy Grounds Café) and the Dugan Polk Family Reading Room, open twenty-four hours and accessible with your Wildcard after the Library is closed. The first floor offers various options; there are numerous tables which can accommodate four or more students and there are comfortable armchairs in the Speakers’ Corner. The twenty-four hour lounge is also on the first floor. The second floor Learning Commons offers a number of study areas. In the corridor between rooms 204 and 205 and the math and writing centers is a long row of curving couches with end tables. Rooms 204 and 205 are available for study unless there are events scheduled. At the front of the building is an area with couches, arm chairs and tables and chairs. There is another lounge at the back of the building by the entrance to the Dugan Polk Family Reading Room. And in front of the Old Falvey entrance to the Reading Room is a large lounge filled with comfortable armchairs. Two lounge areas, carrels, tables and chairs and group study rooms are available on the third floor. At this time of year, the group study rooms may be used only by undergraduates and non-law school graduate students. To use one of the group study rooms, you obtain a key at the circulation desk by two students presenting their Wildcards. There are no reservations and rooms are available for two hours. The fourth floor is a designated silent study area with carrels, tables and chairs, and a lounge area with a couch and armchairs near the back stairs. So here are your choices, four floors of assorted study spaces and seating including two twenty-four hour rooms accessible after hours with your Wildcard. Falvey wishes you luck on your exams! 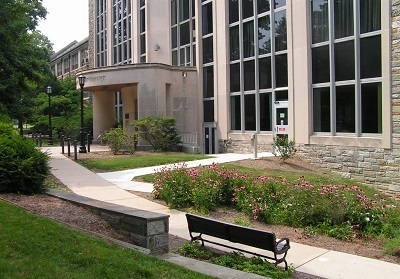 Photograph courtesy of Falvey Memorial Library.